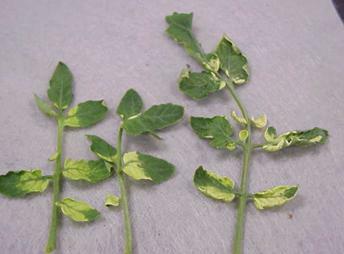 Symptoms: When tomatoes are exposed to the herbicide glyphosate, or Round Up, the leaflet bases turn yellow (see photo below). This herbicide is systemic, so if the stem is sprayed accidentally, the herbicide moves into the plant's system and causes this symptom. Management: Never apply herbicides under windy conditions and avoid applications to areas in or near vegetable gardens and flower beds. Use a separate sprayer for fungicides and insecticides. Recovery depends on the amount of damage and the health of the plants. If damage is slight and plants are healthy, they may recover.